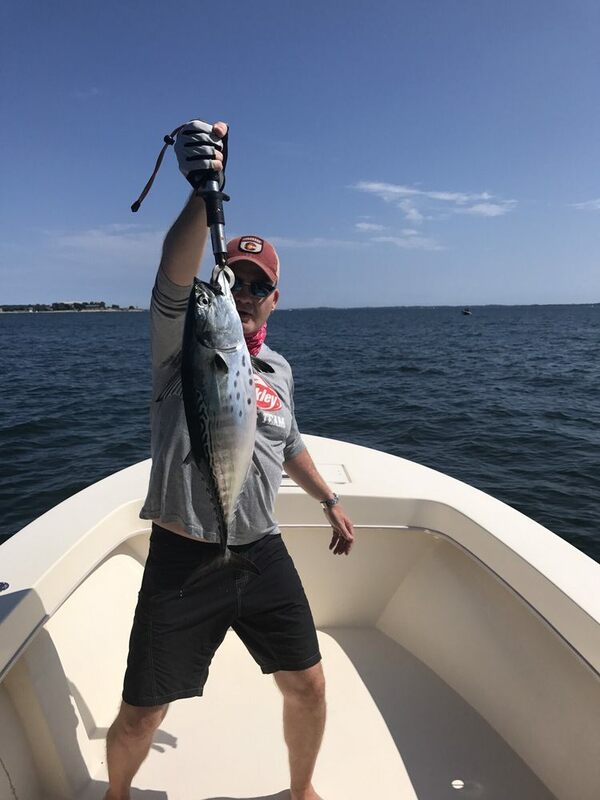 Wow… North Carolina is False Albacore Heaven!!!! So the end of day two with two great fishermen and really nice people from Massachusetts. Charlie and Darlene are here for 4-5 days and false albacore fishing with me for 3 of those. We’re fishing spinning rods and fly rods. We have several goals this trip. 1) Set the ladies 4 lb record for False Albacore on a fly rod 2) See a new place and have a good time and a fun adventure while doing it. 3) Catch a bunch of False Albacore. We have already met two of the goals in that they’ve caught more Albies in the first two days than you can count. They’re having a great time and seeing lots of interesting and new things…..but, we are having a heck of a time getting out record fish on 4 lb test. Darlene has hooked and lost 8 Albies on the 4 lb so far. We spent about half the day today trying to get that record fish. One thing is for sure though; all the fish she is hooking would be the record if we could ever get them to the boat. These Harkers Island fish are BIG. Darlene got one at or over 15 lbs today on the spinning rod and that fish wasn’t at all usual for down here. After we quit our quest (for today anyway) for the 4 lb record Darlene began hammering the Albies again on the spinning rod. There was one spot we fished today near the beach at Beaufort Inlet that had Albies blasting out of the water for as far as we could see in all directions. It was Albie mayhem…..actually hard to believe that there are that many fish around to blow up the way these fish were going crazy on baits. Not an exaggeration that there were 10’s of thousands of Albies blowing up everywhere for maybe an hour. Both Charlie and Darlene caught plenty. Weather yesterday was gorgeous but today was cold, blowing to 20 mph with occasional rain…..I mean nasty but the Albies seemed to love it. On the fly rod the Albies were breaking her off and she was using a small fitting-fruiti cloister minnow. On spinning rods we were using 1 oz diamond jigs and 3/4 oz jig heads with 3” swim baits. Anyway, starting at 8 AM tomorrow we’ll be back at it to ‘seal the deal’ on our 4 lb women’s False Albacore Fly Rod record. Watch for tomorrow’s report to see how she does. Previous postBe Thankful for Radar!! !